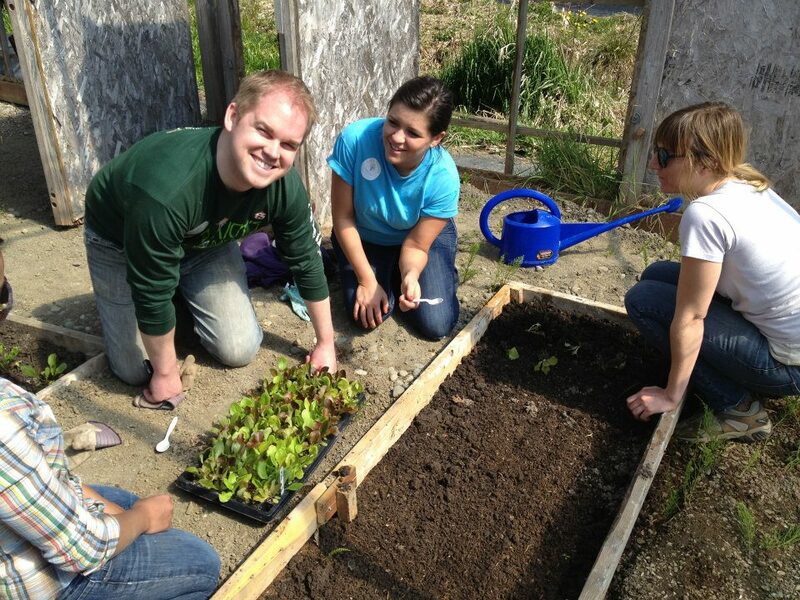 JLS members working at Seattle Tilth. Done in a Day is a hard working committee that develops inspiring and motivating projects that enable the Junior League of Seattle membership to get directly involved with volunteer opportunities across the Puget Sound area. Seattle Tilth is an organization whose mission is to inspire and educate people to grow food organically, to conserve natural resources, and support local food systems in order to cultivate a healthy urban environment and community. Part of their curriculum involves educating children through providing a safe and fun place to learn how to tend a garden and take care of the environment through school groups, summer camps, and working together with their families. 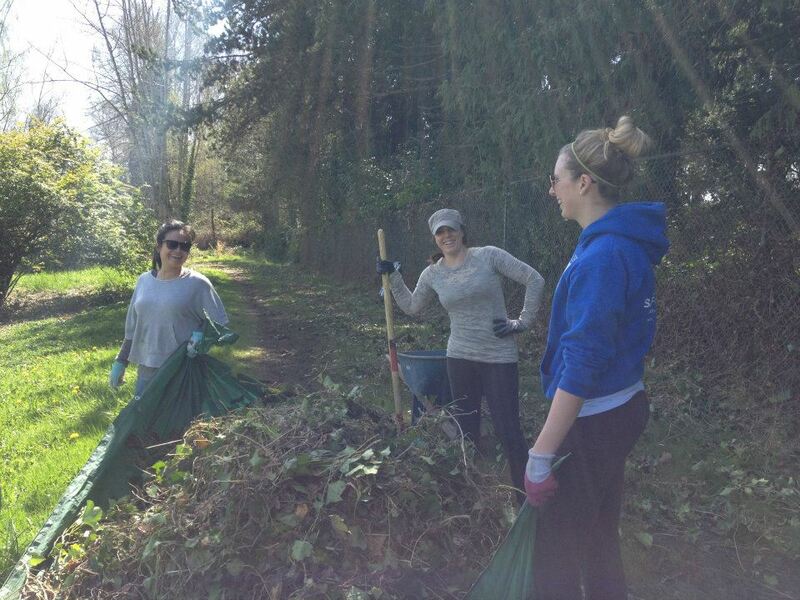 Due to the fact that the mission of Seattle Tilth and that of the Done in a Day (DIAD) committee are harmonious, the Junior League of Seattle has been pleased to partner with them to offer service shifts for our members in order to make a positive impact in our community. 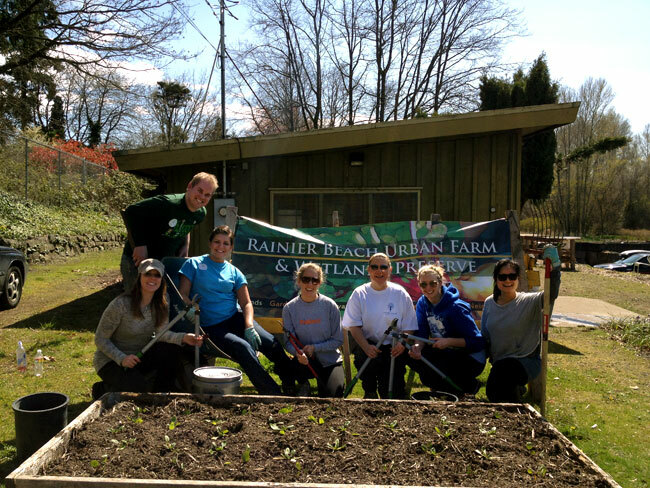 A JLS service shift – gardening with Seattle Tilth. During our first service shift with Seattle Tilth, Junior League of Seattle members visited their Good Shepherd Garden in Wallingford on a blustery fall afternoon. Members composted leaves, scattered mulch, harvested lavender, fortified worm habitats, and helped put the gardens “to bed for winter” at Seattle Tilth’s the adult learning center. Members were invited to bring their children and were excited to be able to partake in a variety of activities. Since most attendees were true gardeners at heart, we were thrilled at the educational lecture on composting we received by an industry expert. As an added bonus, we were all invited to take home bouquets of fresh lavender! 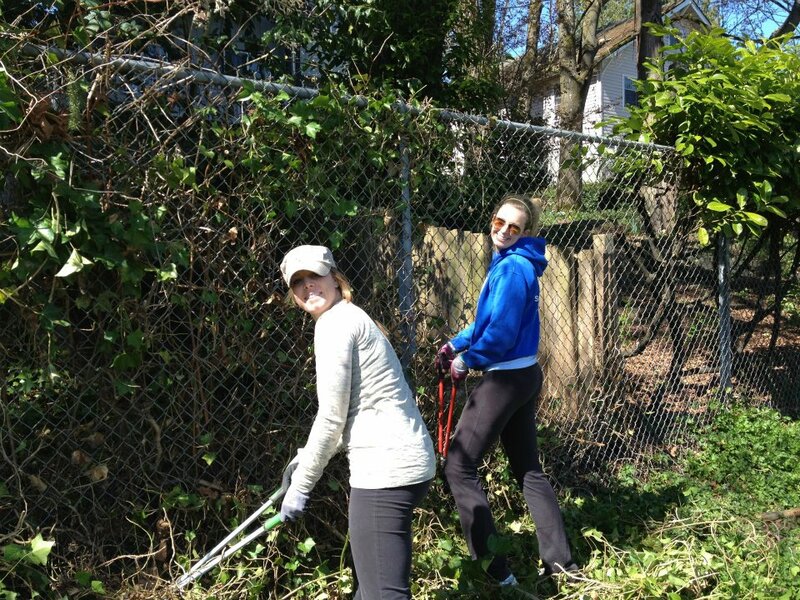 Removing ivy from a 200ft fence with Seattle Tilth. On the second service shift with Seattle Tilth, members chopped down English ivy, Himalayan blackberries, and English holly along a 200-foot long fence. It was important to get at the blackberries before the birds and animals ate them and spread them all around which would ultimately cause long term root damage to the surrounding vegetation on the wetlands. Cultivating the local wetlands is a project that the folks at Seattle Tilth are trying to grow for their various programs. The ivy, as we all know, can strangle a tree, and in some cases, left unattended over the years, cause its death. It was a huge satisfaction to all when we could look down 200 feet of bare fence at the end of the day and understand our full accomplishment! A few more of our members were given the opportunity to plant lettuce seedlings in one of the many greenhouses on site. The remaining two service shifts for the year are pending, but one this is for sure, Seattle Tilth is an excellent partner, one that we have had a lot of fun working together with, and certainly one that we would like to see many more exciting projects with over the coming years. 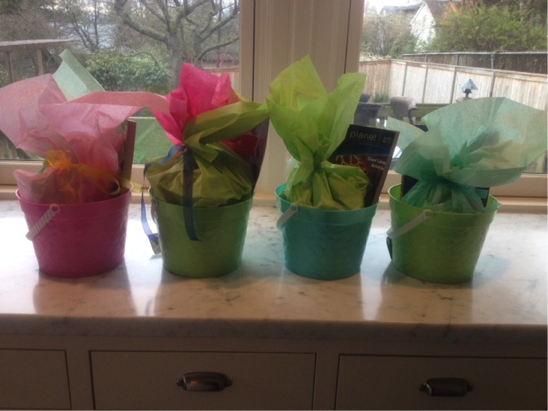 On the evening of April 2nd, a group of Junior League ladies showed up at Allie Okner’s house in Wallingford to create 50 spring baskets for kids living in shelters around the Seattle area. The YWCA, whose homeless shelters are a safe haven to families coming off the street or fleeing domestic violence, sponsored this event and delivered the baskets to the happy kids later that week. We know that these baskets (which were actually beach buckets that they can re-use) put smiles on many kids’ faces as they opened them up to find coloring books and pens, Rubik’s cubes, books, and candy! After arriving at the shift, the ladies got straight to work, unpacking mountains of goodies, dividing them up into proper age groups, packing up the baskets, and wrapping them all up with ribbon. It was a casual and fun shift and gave the ladies time to chat with other JLS members, have a glass of wine, enjoy some sushi and, of course, do something positive for the Seattle community! Hop Hop Hop went the Easter Bunny all through the shelters, delivering over 550 baskets! You helped put smiles on kids’ faces here and there, no need to find anyone, as the kids came from all over to pick up their special Spring Basket! The happiness you helped make happen not only makes a difference to the kids, the families, the case managers and staff, but also from all the volunteers and I that saw your generosity first hand, it was truly amazing and I thank you for it! I hope your holidays were all as wonderful as you made theirs, and I wish you the best spring ever! Thank you all for your help and ongoing support; I have the best donors in the world! Thank you to all of our volunteers who participated! YWCA Easter Baskets assembled by the JLS. We are partnering with Seattle SCORES for this event and need volunteers to prepare bags of healthy snacks, greet students, and help a team as assistant coach for the day. Sign up online, or contact Gina Hall at hall.gina@comcast.net for questions. There are 10 service shifts available to help out with the Mother’s Day Basket provisional project! Help us by picking up bags on May 5, between 1:00 – 3:00pm, from the Junior League of Seattle office and delivering them to local shelters the week of May 7 – 11, 2012. Each shift opportunity is for delivery to a specific shelter and we need one volunteer for each shift. Sign up online. JLS volunteers at the Wellspring Baby Boutique on Impact Day 2012. Bright and early on Impact Day, March 24, 2012, fourteen Junior League of Seattle ladies arrived at the Wellspring Family Services Baby Boutique on Rainier Avenue for a tour of Wellspring and to help sort clothes in their Baby Boutique. The Baby Boutique is a “free store” for homeless families with children. It supports families that are in the cycle of homelessness by providing them with clothing, diapers, infant formula, baby equipment, toys, books and many other essential items. 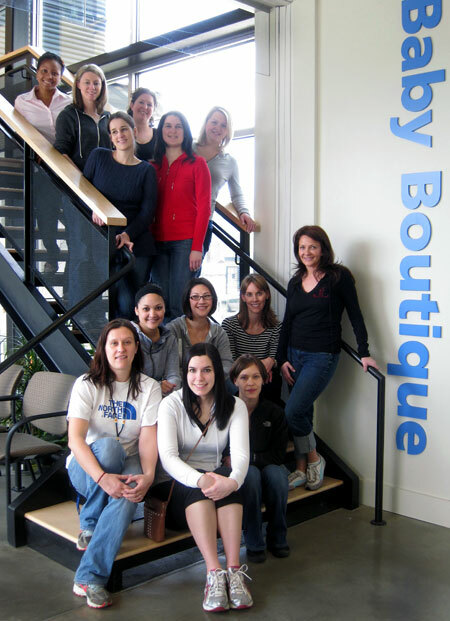 In 2010 alone, the Baby Boutique served nearly 3,500 homeless children in the greater King County area. Initially, the shift was supposed to entail sorting through donations, but the efficiency of a Junior League woman should never be underestimated! We soon moved onto stocking the store and helping some of the kids pick out clothes, books and toys. OK, it was two words, but it was still the cutest and most rewarding thing we heard all day! Sorting clothes at the Wellspring Baby Boutique. The Junior League of Seattle thanks Wellspring Family Services for the privilege of allowing us to work with you this year. Wellspring was established in 1892, and is celebrating 120 of service to our community. If you would like to learn more about Wellspring Family Services, please click on their name to follow a link to their website. Junior League of Seattle volunteers at the Wellspring Baby Boutique on Impact Day 2012. The homeowners you will be having a direct impact on are Tamera and Lou LeCroy. They are a couple living in the Skyway neighborhood of South Seattle. Some of the work for Tamera and Lou that we will be helping out with include: exterior painting, light carpentry work (with help from experts), and lots of yard work. All volunteers are welcome to come and work for the full day. If you intend to stay for the full day, please make sure that you RSVP for both service shifts via the website so that you will get 2 credits for staying the entire time. If you are bringing friends and family to help work for the day, please send an e-mail to Anna Ferris at annaf2@gmail.com letting her know you’ll be bringing extra helpers! In preparation for the event next week we want to provide you all with helpful details that will make the day run smoothly. 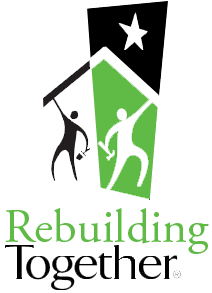 Please visit our Rebuilding Together event website for the location, directions, appropriate dress attire, waivers to sign and bring with you to the event, yard work tool requests, and misc. info. Impact Day is March 24! One of the greatest gifts we, as leaders in our community, can give is service to to the betterment and health of that community. In keeping with our mission statement, Impact Day is also a time we can promote voluntarism by inviting our friends and family to participate in our service shifts. I would like to encourage each of you to sign up to make an impact this year. Join the Done in a Day committee and your Junior League friends to toast a job well done from 2 pm – 6 pm. After a day of hard work, celebrate our accomplishments with a drink with friends. The Done-In-A-Day Committee, along with the support of the Community Wing & the Impact Day Provisional Project, are excited to present IMPACT DAY MARCH 24th, 2012! Currently, we have 10 Different Service Opportunities that will need over 150 volunteers for March 23rd & March 24th. We hope that you can find the time to get out and support our Non Profit Partners for the Junior League of Seattle’s BIG Day of Service! Our goal is to make a HUGE IMPACT! Please see below of the shifts that are out on Digital Cheetah to sign up for. There will be more shifts to come! We need your support and on some of the shifts we would appreciate the support of your family & friends! Junior League of Seattle members at Northwest Harvest. Shift:NW Harvest service shift on October 22, 2011. 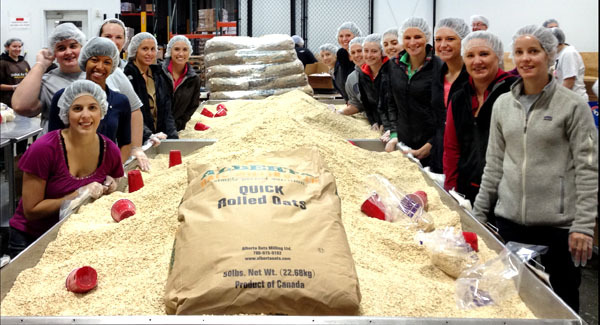 Donning plastic gloves and plastic hair nets, Junior League of Seattle members packaged 12,350 lbs of food for delivery to over 11,300 families in the greater Seattle area on October 22nd with Northwest Harvest. The mission of Northwest Harvest is to provide nutritious food to hungry people statewide in a manner that respects their dignity, while fighting to eliminate hunger. Their vision is to have ample nutritious food available to everyone in Washington State. Refugee Women’s Alliance teaches a job skills class for refugees to help them build resumes. Two Junior League of Seattle members helped students write their experience, skills, and job history into template form while four other members manned the computers and turned the template into resumes. Participating in the resume writing was a hands-on, face-to-face mentoring experience and truly the epitome of empowering women. In many instances, the refugee’s background experience consisted of running their own households or in selling items at a market back in their home country. The Junior League members encouraged these women to think beyond just housekeeping as a potential career path and helped the women identify skills and experiences they have that could be used in other roles. Several of the volunteers said it was the best shift they had done with JLS, and we hope to identify more opportunities to work with them in the future. On the REWA volunteer shift: The volunteer shift on Friday was such a rewarding experience. I felt like I contributed a lot and made a connection with people and that my skills were used. I was telling all my friends and family about it! I would highly recommend this shift as a once month opportunity for JLS members. Done In A Day is presenting multiple shifts this year our new partner YouthCare! One service shift was held 10/19/2011 at the Orion Center, which is a multi-service facility open to youth ages 13 – 22. It offers a safe, open place where youth (including trafficking/child prostitution victims or those at-risk) can access a multitude of services from meals to case management. The first step is the Drop-in Center, which offers three meals daily, showers, laundry, clothing, hygiene supplies, knowledgeable staff, and a safe, non-judgmental environment where youth are met with compassionate care. This year the Junior League of Seattle will be providing dinners and other service shift opportunities at the Drop-in Center for these at-risk youth. These shifts will be hands-on and we will be interacting with the youth. We are excited about this new partnership and hope you can come to one of our shifts. Shift: YouthCare dinner on October 18, 2011. Junior League of Seattle volunteers served pizza, salad, fruit cocktail and fresh baked cookies to teens at YouthCare. The teens were very excited about the Domino’s pizza. The staff at YouthCare are so helpful and extremely appreciative of our partnership. The Done-In-A-Day volunteers were excited to serve the teens and said they all received many thank you’s in the buffet line. Everyone had a very positive experience, were impressed by the services offered at YouthCare, and are looking forward to returning soon.